The University of Hawai’i basketball team’s five-game winning streak came to an end with a 75-71 road loss t0 UC Riverside at the SRC Arena in Riverside, Calif., on Saturday. Jack Purchase scored 24 points and the Rainbow Warriors had one of their best shooting games of the season, but it was not enough against an equally hot-shooting Highlanders squad. Hawai’i dropped to 11-6 overall and 2-1 in the Big West Conference. UCR improved to 7-13 and 1-3. 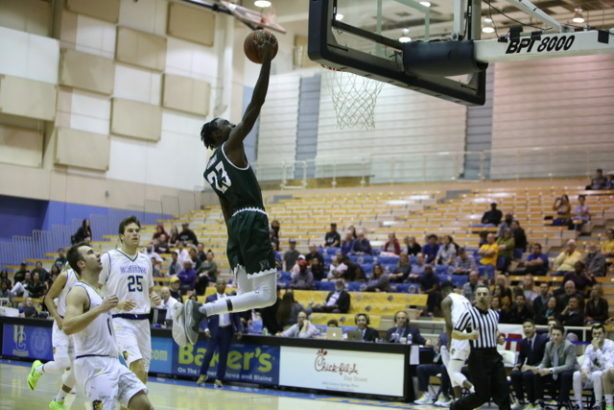 Sheriff Drammeh added 15 points and eight rebounds, Zigmars Raimo had 11 points on 5-for-5 shooting, and Drew Buggs contributed nine points, nine assists and six rebounds for Hawai’i. The Warriors 55.8 percent from the field (29 for 52), but allowed the Highlanders to 53.7 percent (29 for 54). What’s more, UCR went 13 for 25 (52 percent) from 3-point range. The 13 3s are the most allowed by Hawai’i this season. Freshman Dragan Elkaz led the way for UCR with 25 points, including 7 for 10 from 3-point range. The Warriors hit nine of their first 11 shots from the field to open the game, and held a 21-13 lead at that stage of the game. Hawai’i led by as many as 11 (26-15) midway through the first half. The Highlanders used an 11-0 run late in the half to take a 35-32 lead with 1:27 remaining in the first half. They eventually took a 36-34 lead at intermission. After the hot start, the Warriors ended the first half at 58.3 percent from the field, and Drammeh scored 12 on 5-for-7 shooting. But the Highlanders were not far behind at 53.8 percent, including 6 for 13 (46.2 percent) from 3-point range. UCR maintained the lead for the entire second half. The Warriors trailed 64-61 with less than four minutes remaining, but UCR’s Dragan Elkaz completed a four-point play – he drained a 3-pointer, got fouled, and made the ensuing free throw – to give the Highlanders a 68-61 advantage with 3:44 remaining.